It’s time for another Cute Outfit Ideas of the Week! This is edition #38 and it’s dedicated to traveling in style, but choosing pieces that are versatile. Our family has done quite a bit of traveling this summer and we’re not done yet. My oldest two are getting prepared for a 10-day out of the country trip, my husband has a weekend trip planned and we’re all headed to a California wedding in August. This has been the summer of travel for us and it has been so much fun! When it comes to traveling and what to wear, you want clothes that don’t take up a lot of suit case space, don’t wrinkle and can easily transition from day to night. By making a few smart choices, this is possible. Here are a few cute outfit ideas that make packing for your next trip a breeze (and you’ll look phenomenal). The cotton jersey dress from eShakti is perfect for traveling and throwing in your suitcase. It’s extremely lightweight, so it barely takes up any room. It can easily transition from day to night by swapping out the ModCloth sandals for a pair of heels or wedges. It’s a no fuss dress, for a no fuss/no worry outfit. You can focus on your vacation and not stress over your outfit! 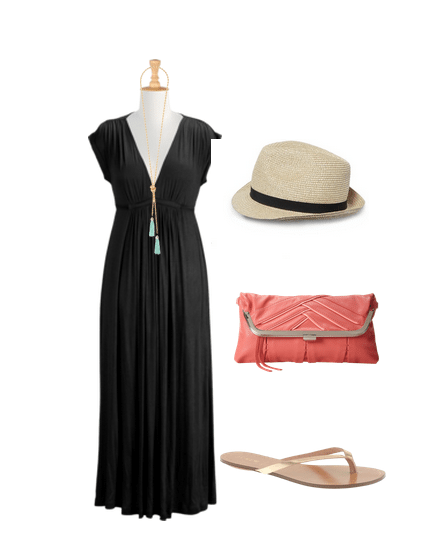 A black maxi dress is a go-to fashion piece every girl should consider owning. You can dress it up or down, and even throw it over your bathing suit for a cover up. Not to mention how easy a maxi dress is for travel! It’s super comfortable whether you’re in a car or a plane. It’s a throw-in-your-suitcase kind of item and it’s flattering on all body types. This empire waist maxi dress from eShakti has a very soft feel, slips on right over your head and features a draw string tie to give your waist definition. This gorgeous shirt from ModCloth is a definite go-to shirt for summer and travel. You can wear this with jeans, shorts, a skirt and even throw a blazer or denim jacket over it. Your options are endless! 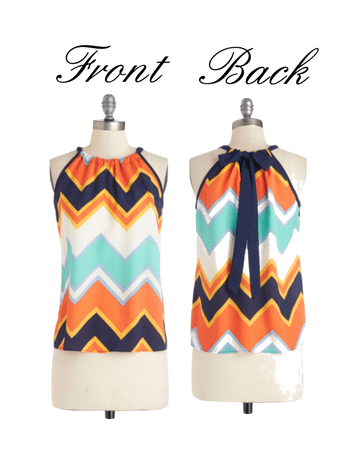 And did you see the cute bow on the back?! It’s lightweight enough to carry in a weekender bag for easy peasy travel. The pattern and colors also pop and are an instant mood lifter. Are you ready to pack for your next trip? I hope I gave you some cute outfit ideas for your next vacation or weekend getaway.